Disney, Lucasfilm, Anticipointment, and Snow White. It will be fine. Really. This week's announcement about Disney buying Lucasfilm has led to a lot of speculation. To me, it is simple: The Lucasfilm deal is about copyright and trademarks. Disney built its empire on a mouse and a few other characters of note from the mind of Walt Disney and his crew. They do entertainment superbly and own what they do. Everything else has been built from that. A substantial amount of Disney content came from the realm of public domain. Folk tales or stories so old that no author had to be paid to use them. Snow White was the first "full length" Disney cartoon. This was in 1937. It was a great risk to the studio when it was launched. Snow White was produced, well over budget at a cost much higher than expected. It was called "Disney's Folly" by some. But on its release, it became a sensational hit. In 1944, Snow White was re-released. It became a new film for new viewers. With subsequent reissues every 7 to 10 years, Snow Whilte now ranks among the top selling movies, ever. Over the 70-plus years of release, Snow White has had gross sales of more than $400 million (probably much more, depending on how you count the money with inflation). 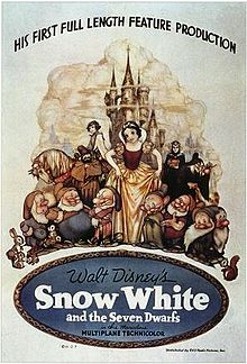 Snow White led to a building catalog of Disney versions of public domain stories over many decades which are now a fixture in popular culture; Pinnochio, Sleeping Beauty, Alice in Wonderland, Cinderella, Jungle Book, Little Mermaid, Beauty and the Beast. Back before the dawn of Disney, copyright law in the United States protected the ownership of creative works, but it was limited to 28 years after creation. Through changes and revisions starting in 1831, the protection of copyright expanded, now all the way to the life of the author plus 70 years. Content OWNERS are king. By purchasing LucasFilms, Disney has taken ownership of iconic content that they will be able to extend, exclusively, for generations to come. Disney is getting control of the story and the characters. Here's a video and blog that was produced about a year ago that talks about much of this - and about the creative works of George Lucas. The blog and video are a breezy run through of the reason for copyright and complaints about the current law. There's also a snappy discussion of the "Anticipointment" of the three newer Star Wars films that Lucas released starting in 1997. While those newer movies may not be as beloved by some fans, the story and characters were created and owned by Mr. Lucas. He could do with them as he wished. Under current copyright law, those characters and stories will be owned by the Disney Corporation for 70 years after Mr. Lucas leaves this mortal coil. The trademarking of characters is a different issue - characters are trademark protected as long as they continue to be used commercially by their owner. Comcast, Apple, AT&T, Verizon - they all sell us things that we may want or need, for now. But if you want Star Wars in your future, you will have to turn to Disney.